SPANISH LANGUAGE VERSION. FAIC's Emergency Response and Salvage Wheel has essential information on protecting collections when disaster strikes. This hands-on tool will help you find information quickly and effectively so that important artifacts aren't lost forever, and is an important part of your disaster preparedness planning. Side 1 of the Wheel outlines the critical stages and steps of disaster response, while Side 2 provides salvage steps for 9 types of collections, including books, documents, photos, electronic records, paintings, and more. The Wheel itself is 11 x 10 in. (28 x 25.4 cm). 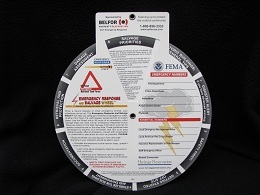 The Wheel was reprinted in 2016 with the generous support of Belfor Property Restoration. For more information about this supporter, please visit /www.belfor.com/en/us.